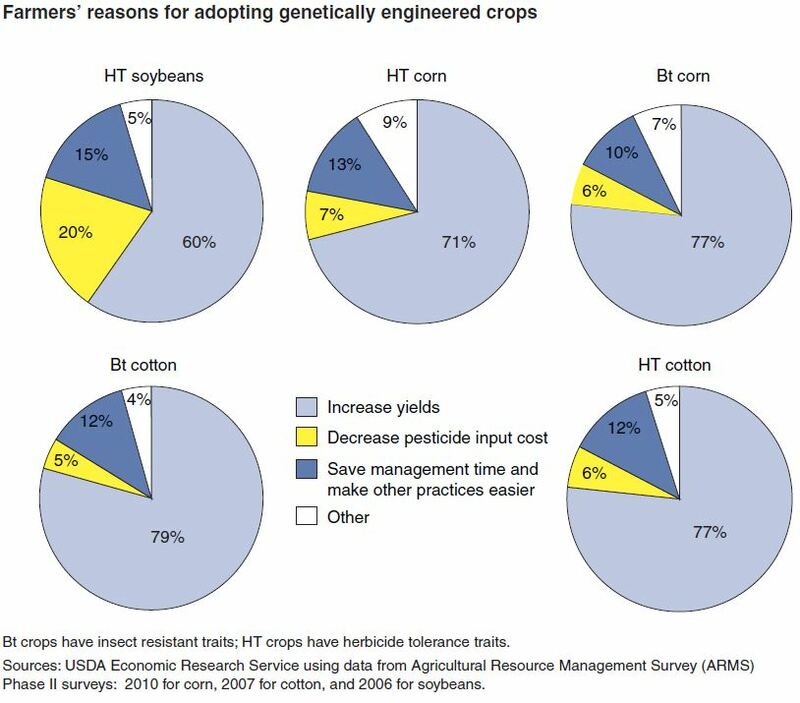 »Benefits»Why Do Farmers Use Genetically Modified Crops? Why Do Farmers Use Genetically Modified Crops? From reading popular media, you could quickly come to the conclusion that the main supporters of genetically modified (GM) crops are the seed companies and most scientists. Shouldn’t we ask farmers who actually grow the crops why they use them? For most of us, our closest farm experience is the grocery store. However, there are over 2 million farmers in the US, and over 90% of the corn, soybean, cotton and sugar beets grown last year on over 180 million acres are GM varieties, so clearly these farmers must know something about them. Several summers ago, we went to a family reunion in Pennsylvania at the farm that has been in my wife’s family for about 250 years. This dairy farm is about 400 acres which includes pasture, alfalfa and a lot of corn which is mostly used for silage. The corn was vigorous and deep green, amazingly uniform, and very little soil was visible between the rows because it was covered with crop residue from the previous year. I asked what type of corn they were growing. They were growing herbicide tolerant GM corn because it is compatible with minimum tillage and it makes management of weeds easier. After adopting minimum tillage practices, they observed reduced runoff from heavy downpours during thunderstorms, and what water did runoff was fairly clear, indicating that soil was not being eroded and washed away. Many of the neighboring farmers are Amish, and on a drive into town I noticed how good their corn fields looked as well. It turns out that the Amish also use GM corn. This was a little surprising, as they are not usually known for adoption of new technologies. Farming with a two horsepower hay mower. 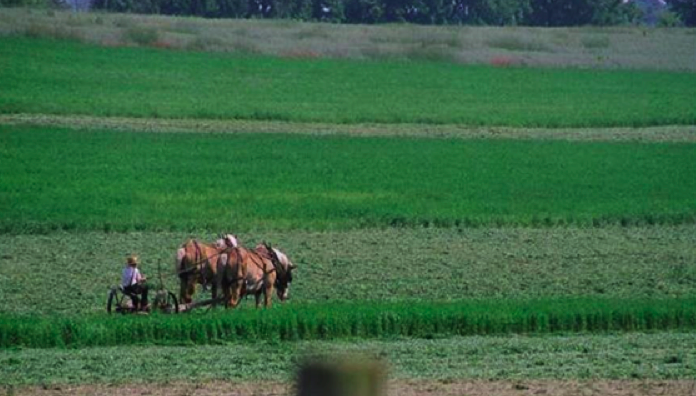 Amish farmers also grow insect resistant GM corn which is easier to harvest with their horse or mule hitch equipment. Upon returning home to Maui, I learned from a friend at Monsanto that indeed the Amish were early GM adopters, and the company even has a specific protocol for introducing improved varieties to Amish farming communities. I also found that BBC made a video on the use of GM crops that highlighted an Amish farmer in Pennsylvania – it is only a little over 4 minutes and a must-see. They grow insect resistant GM corn because they have determined it is an effective tool for their traditional farming culture that is dedicated to passing on their farms to the next generation. Looking at the bigger picture, the USDA has also been asking farmers since 2001 why they use GM crops (which were first introduced in 1996), and a summary of their data is shown below. Farmers in the US use GM crops mainly because they get increased yields. This, along with decreased pesticide costs and easier crop management, makes their farming business more sustainable. Farmers make rational economic decisions every day, and it is not hard to see why so many have decided to use GM crops. Both the Amish and the English.